Taking a break from brainstorming on a new project, I drive to the coast on an unusually warm, sunny October day. I should sit at my computer and meander down the various paths of discovery to solve this design problem. But this is a day to be seized, and one with a different path to meander. 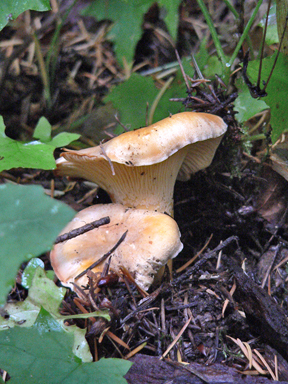 Mushroom hunting, like idea hunting, requires a kind of intuitive search. You don’t know exactly where to look or what you’ll find when you get there, wherever there is. A little more certainty exists in the end result with mushrooms than with creative concepts. Or at least there should be, especially if you plan to eat what you find. Guide books help you identify the unique features of each type of mushroom. Even so, there can still be a shred of doubt, perhaps necessary for self-preservation, as you contemplate a meal using your wild forage. But even with ideas, there is the ah-ha moment, that sense that you’ve stumbled onto just the thing you didn’t know you were looking for. There’s a rightness, as if the solution were under your foot the whole time. An oft-told aspect of mushroom hunting, and which I experience (novice that I am) every time, is that you can be in a forest and know that mushrooms, edible or not, exist within. Yet you cannot see a single one. The more you roam, the more your eye starts to catch smooth rounded surfaces. Sometimes these surfaces are fallen curled leaves masquerading as a mushroom cap. But, as with brainstorming a new design project, you expose yourself little by little to the process. Then you start to see with a new set of eyes once they’ve adjusted to the activity. All your experience with mushrooms, all the information you’ve absorbed over a long period of time, trickles in. One minute you’re scratching your head at the complete lack of fungal activity and then you look down and mushrooms are lining the path like miniature soldiers standing at attention. Both activities require a passive, but focused, engagement. An openness to what comes your way, but with enough sense of where and how to look. Malcolm Gladwell talks about informed intuition in his book “Outliers.” He uses it to explain that so-called geniuses only seem like virtuosos but really blend talent with years and years of practice. Architect Frank Gehry is said to have coined the phrase informed intuition. In an interview, he talked of his “healthy insecurity” and credits it for his “leaving no stone unturned” when he designs. The fuzziness of intuition can make people nervous, especially a client. Applying intuition to any creative process is natural and essential. There is a subjectivity to the process that can’t be ignored. He warned of not being too prescriptive when seeking solutions. What he’s suggesting, too, is that a certain amount of flexibility is required. When we’re flexible, we look at the world from different perspectives. Often, you have to crouch down and turn your head upside down to see underneath ferns and salal, changing your viewpoint. We used to draw still lifes upside down in an art class in high school to avoid drawing on auto pilot. It forced us to really look, seeing familiar objects in an unfamiliar way. Only then do you really see. Incidentally, this is why getting out of your chair and into the woods is essential. Or whatever environment will allow ideas to flourish. For me, nature is an endless source of inspiration, especially if it ends up sauteed with herbs in a cream sauce over a pile of steaming tagliatelle. Both activities also require a fair amount of hunched-over examining of a landscape of possibilities, necessarily alone. It is a luxury and a pleasure to lose yourself in the activity of design. Not so with mushroom hunting. Having been lost in the woods from wandering off trail, I can say it is neither a luxury nor a pleasure. I’ve envisioned ending up on the evening news, but not for my brilliant design work. Regarding mushrooms, a good hunter never reveals where they find them. As for ideas, a good designer can’t. Happy hunting. I can say the same would apply to beach combing—shrooms not being my area of expertise. The way your vision and brain adapt and process past experiences and knowledge until you start to see/find the treasures among the piles.